I met Chaim when I was 10. He was 12. At a Saturday children’s art class at the Legion of Honor, a man came over to me and asked if I was Jewish. I answered. He told me about a Zionist youth group where there was singing and dancing (I didn’t know from Zionism, but singing and dancing I understood.) Somehow my parents allowed me to go, even though, being stalwart communists, they were opposed to Zionism. That was 1946, just a few years after the Holocaust and before the State of Israel. So I joined Hashomer Hatzair – The Young Guard. Chaim and I and the rest of our “plugah” (group) met in the small storefront (“moadon”) – the clubhouse. Our program of “sichot” (discussions), “tiyulim” (hikes), moshavim (camps – summer and winter) and chagim (holidays) was our core center, more important to us than parents, school, even more important than romance. For some 7-8 years, we grew up together in this way in this crucial and intense part of our lives. We learned the WWII Jewish story, and through our leaders came firmly to the beliefs in “socialist-zionism”. We studied Zionist texts and were fiercely committed to the creation of a Jewish country based on the teachings of Marx and Borochov – where Jews would find safety and build a just society. We fully intended to emigrate, to found a kibbutz, to live socialistically and in peace with our Arab neighbors. It was a policy of our movement not to have hired labor (especially Arab) – because we believed that would be degrading and conduce to a “class” system. We had no doubt, no question but that we would carry out this emigration plan – our aliyah – when we grew up. But always singing and dancing. How unquenchable we were in the thirst for this passion. So many memories come flooding – of dancing with our “chaverim” (comrades). Some names come back: Tzippi, Rena, Moshe, Aviva, Leah, Ilan, Yvonne The dances were unending – we must have known 50. Jewish, Hebrew, Russian, Czech, Greek, Italian … We would gather in a circle and, if there was no phonograph (which there usually wasn’t), someone would start the melody and the dancing would begin accompanied by just our raw voices – in circles or with partners or however. I remember and cherish that Chaim and I would always dance the korobushka. One summer our plugah traveled east to Camp Shomria in the upstate mountains of New York. Chaim had spent that year on a kibbutz in Israel and was due to return and head directly to our camp. I see him radiant and looking very Israeli in sandals and a Russian-style shirt and bounding into our embrace. More. Chaim and I were also involved with non-zionist radical, communist-led (or fronted) activities outside of our group. Sunday in the late 1940’s, we stood, he and I, near the entrance of Sigmund Stern Grove where an outdoor summer concert was to be held. We gathered signatures from the incoming concertgoers for “the Stockholm Peace Petition” outlawing nuclear weapons. I can see him very clearly with his clipboard, approaching people. Several of us, including Chaim, gravitated to the LYL (Labor Youth League) – many long evenings of discussion and painful self-criticism. I have a memory of meetings on a big beautiful arty boat in Sausalito. The name “Varda” comes to mind – Varda the artist. Was that his boat? And, there was the bohemian part in our teens – the mysterious and transgressive world of North Beach lured us – me more, much more than Chaim. But the two of us did have some beatnik days together drinking wine (we were underage) in Vesuvio’s. And there was always singing and dancing. With active zionism behind us, after Chaim moved back to Berkeley from Pennsylvania, we often met to dance on some lawn – in a park, in front of I-house (International House) or to shmooze in the Mediterranean Café on Telegraph or to browse the bookstores. More, channeling back to early years. I remember, that as an adolescent Chaim was a budding biologist. He kept dark jars in a row and cuttings of things in his back yard in the Sunset district. Talked about splicing and made experiments. This curiosity about growing things continued and, if I’m not mistaken, carried on into the back yard in Berkeley. I brought my children Yossi and Rachel to visit Chaim and Ruth; they played among the Glasser fruit trees. Chaim explained some of the tree families to me. Chaim was a linguist – as well as an adorer of Noam Chomsky – both linguist and politico to this day. (Don’t get me started on Chomsky – it would not be nice.) Even in later years and separated by 3000 miles, I called occasionally from New York to ask about a turn of phrase, a construction, an etymology. One day, when we were in Moe’s bookstore in Berkeley, separated by some aisles, I happened upon two copies of a little book on Esperanto. 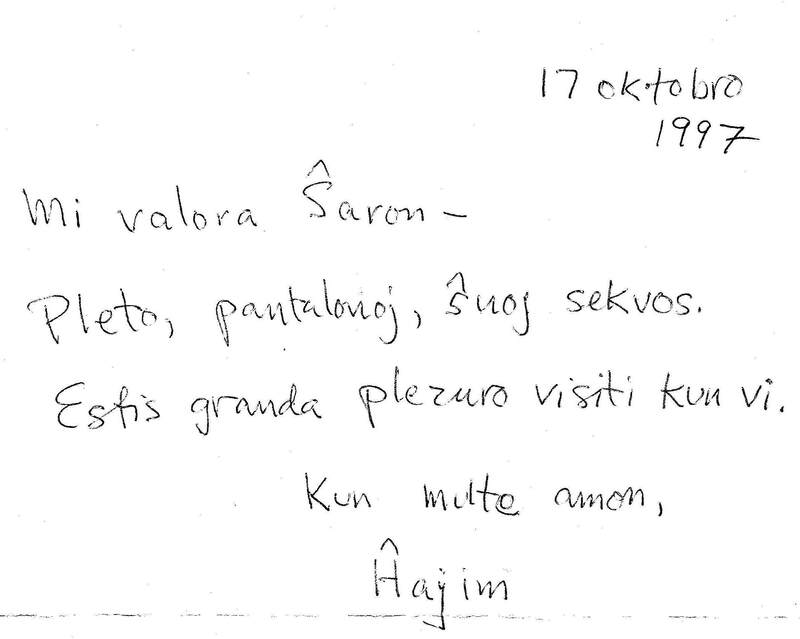 Chaim’s Esperanto letter to me. There are jokes, stories and understandings that we shared where we didn’t even have to speak in order for recognition and memory to kick in. On a call I asked if he had a VCR machine I wanted to send him a tape. There was a slight pause. “Yes,” he said. “Do you know how to use it?” I asked. There was another pause. “… this summer”, he said. We burst into laughter – both knowing exactly what was meant; to wit, that he didn’t know, that he was not up on “technology,” that somebody had probably gifted or pressured him to buy a machine, that he intended to mount a summer campaign to learn. All this was understood in that pause. I came to know and love Ruthie. She always stunned me with her beauty, her compassion and independent spirit. I never had the joy of seeing her in a dance performance but I can imagine that it would be a picture of grace filled with content. She seemed to remember in detail the visits that I made and would often, in these later years, remind us of this or that. How she took care of her beloved Chaim in his last years grabs me at the heart. Losing Chaim, I lose a part of myself. This entry was posted in Letter, Reflections and tagged death, friendship, Hashomer Hatzair on July 30, 2014 by proustmatters. A beautiful remembrance. We were both in the same political and adolescent space at the same time but I envy your sharp memory of this period. Mine is only a blur with disjointed bits and pieces but with the same glow of inspiration. If Chaim helped you to remember all this he was indeed a gift to you.